Echo360 yesterday updated its video and engagement platform to enhance the user experience for nearly 3 million students worldwide using the platform. Contextual notes are linked to class presentations and videos, so students can jump from their words to those of the instructor. Image Credit: Echo360. Inform the instructor that they are struggling with the click of a button. 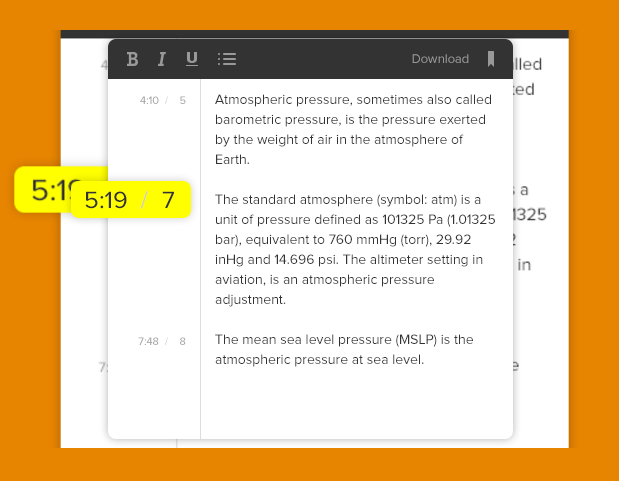 In addition, students and instructors can now arrange media streams in a side-by-side view, so that they can watch class lectures or review a presentation while simultaneously taking notes. They can also arrange content to emphasize what is most important to their learning. Echo360 gives flexibility to students with busy schedules who cannot attend class due to outside commitments and responsibilities. Two-thirds of students attending Indian River State College (IRSC) in Florida, for example, work while enrolled in school and the platform allows these students to have 24/7 access to course content. They can even use the platform on their phone, as the mobile version allows students to view a presentation, respond to polls, ask questions and participate in class discussions with their peers. IRSC Vice President of Institutional Technology and Chief Information Officer Paul O'Brien said in a statement, "Students are telling us they've changed courses because they wanted to take the class with an instructor who was using Echo360 to incorporate video into learning and facilitate interaction with faculty, peers and content."